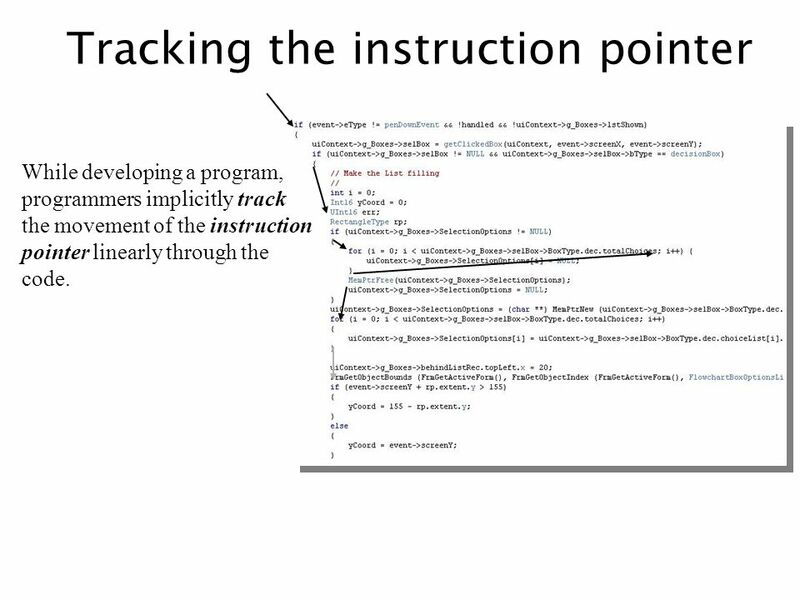 While developing a program, programmers implicitly track the movement of the instruction pointer linearly through the code. 6 Can we separate logic from control? 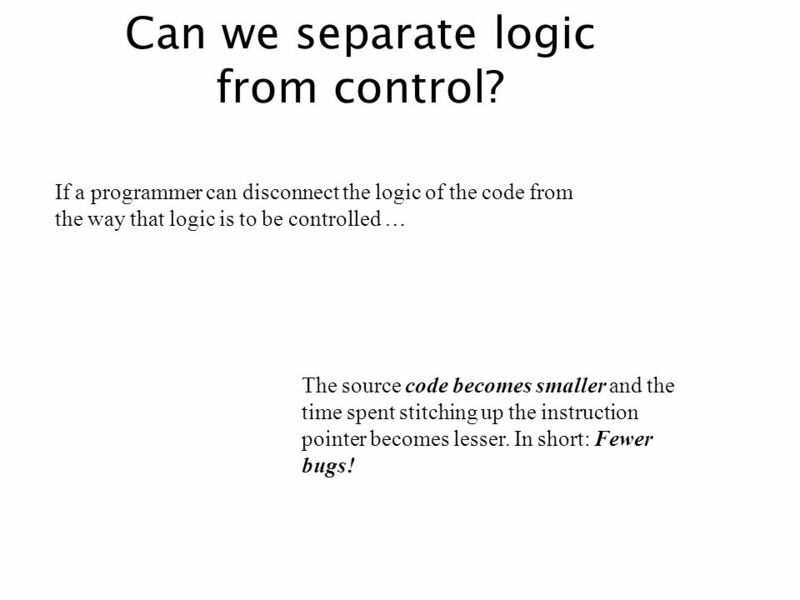 If a programmer can disconnect the logic of the code from the way that logic is to be controlled … The source code becomes smaller and the time spent stitching up the instruction pointer becomes lesser. In short: Fewer bugs! 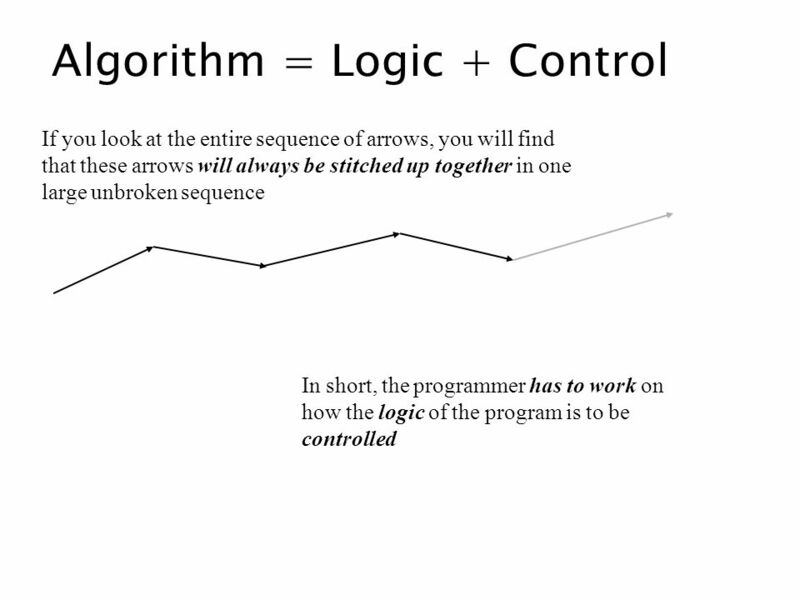 When using Prolog to solve problems, it is important to discard all notions of procedural programming Issues such as stitching up the instruction pointer is no longer your concern. 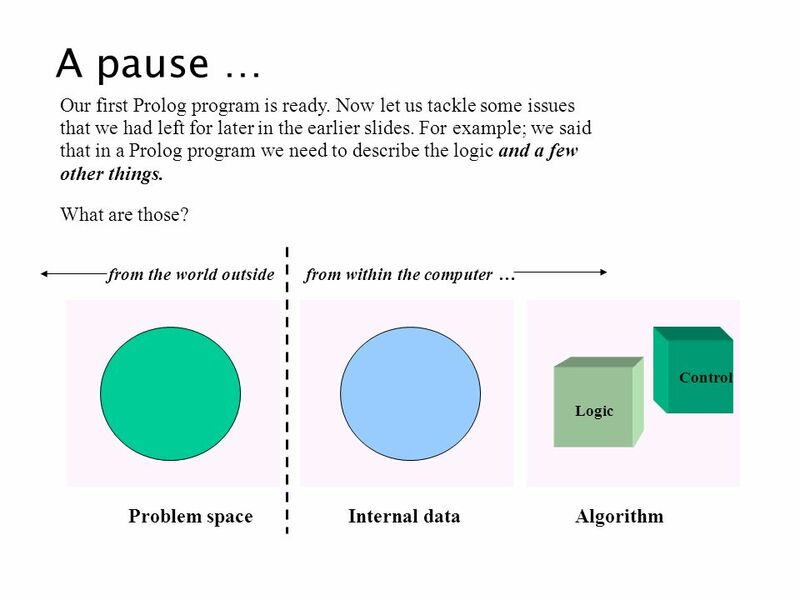 The Prolog system will do it for you. Just have faith, and worry only about the logic (and a few other things which we’ll come to later) But before we jump to Prolog …. 8 What is logic? The words logic, logical, etc. has common interpretations. 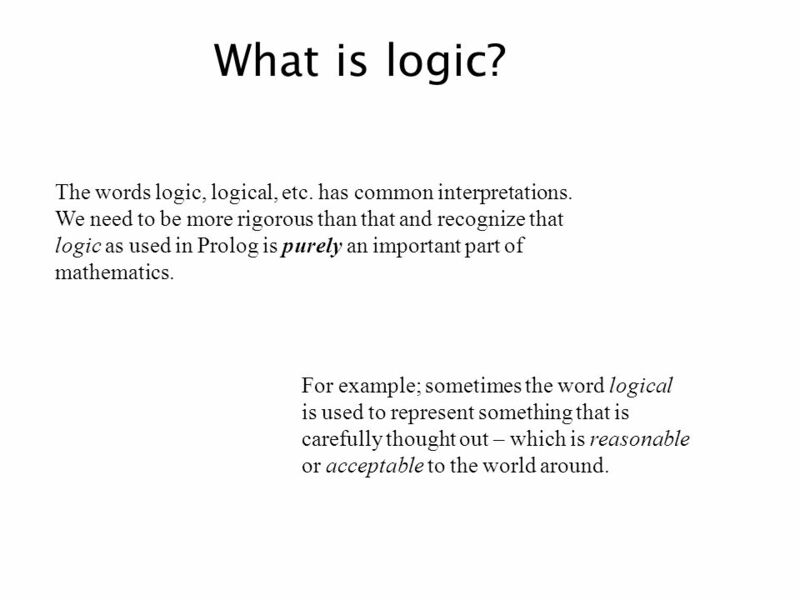 We need to be more rigorous than that and recognize that logic as used in Prolog is purely an important part of mathematics. For example; sometimes the word logical is used to represent something that is carefully thought out – which is reasonable or acceptable to the world around. It is well known that the mathematical symbols “1”, “2”, “3”, etc are equally weighted. That means, none of them have “superiority” over the others. 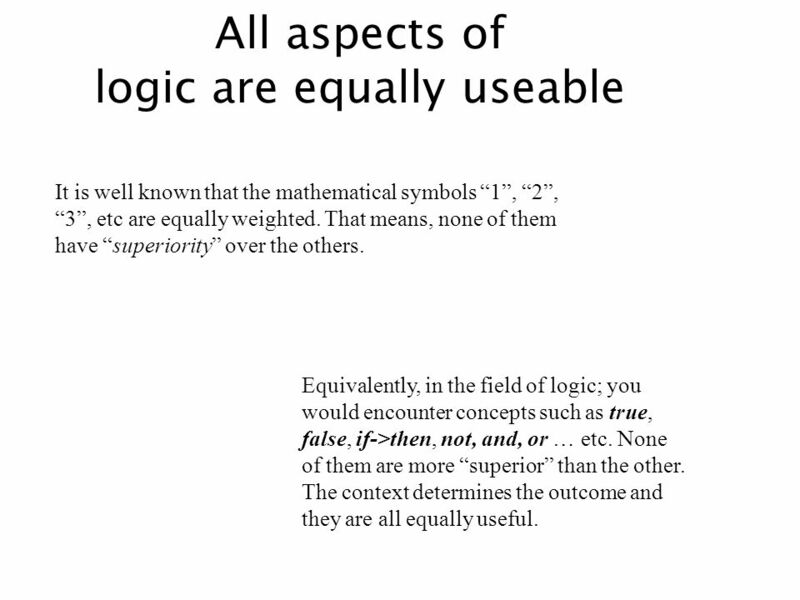 Equivalently, in the field of logic; you would encounter concepts such as true, false, if->then, not, and, or … etc. None of them are more “superior” than the other. The context determines the outcome and they are all equally useful. 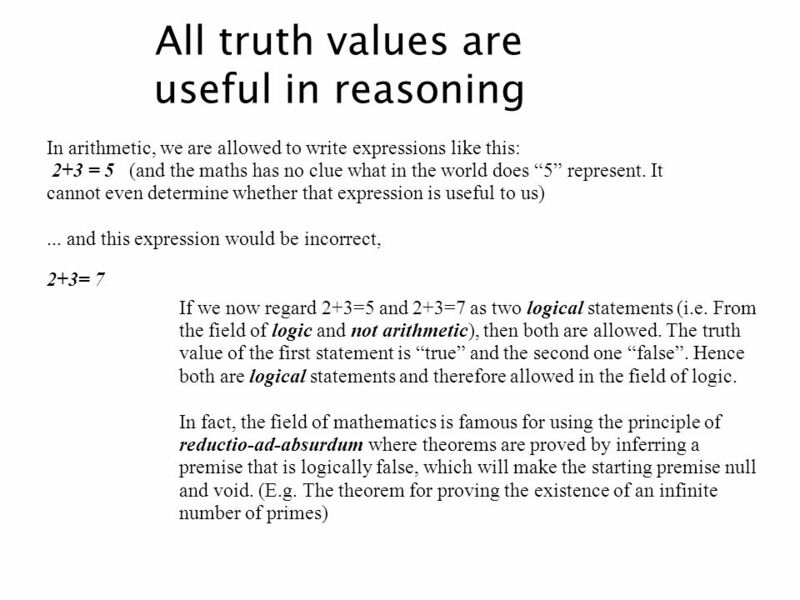 10 Logic is a tool Logic is the tool for correct reasoning. However, not all logical operations may lead to scientifically valid conclusions. Or even things that are useful to us. It all depends on core premises that may have been made in the said operation. 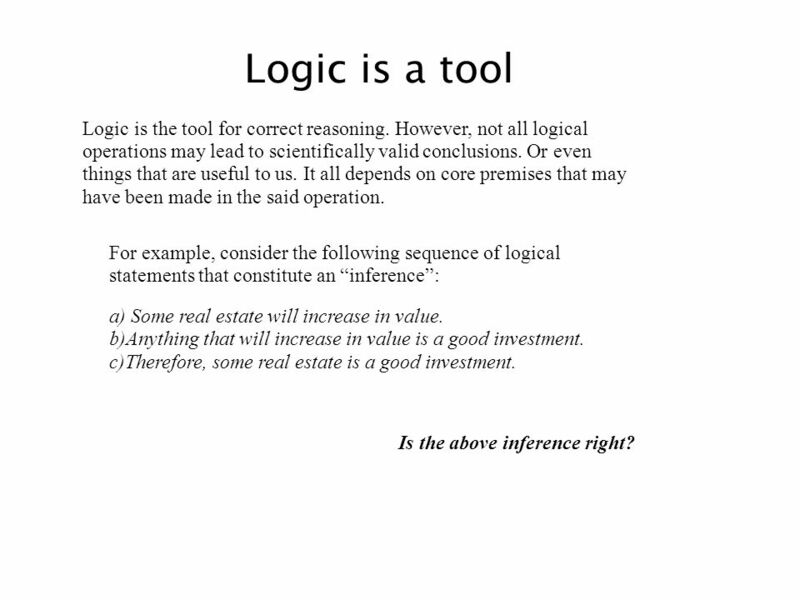 For example, consider the following sequence of logical statements that constitute an “inference”: a) Some real estate will increase in value. b)Anything that will increase in value is a good investment. c)Therefore, some real estate is a good investment. Is the above inference right? 11 The maths is right, but ... 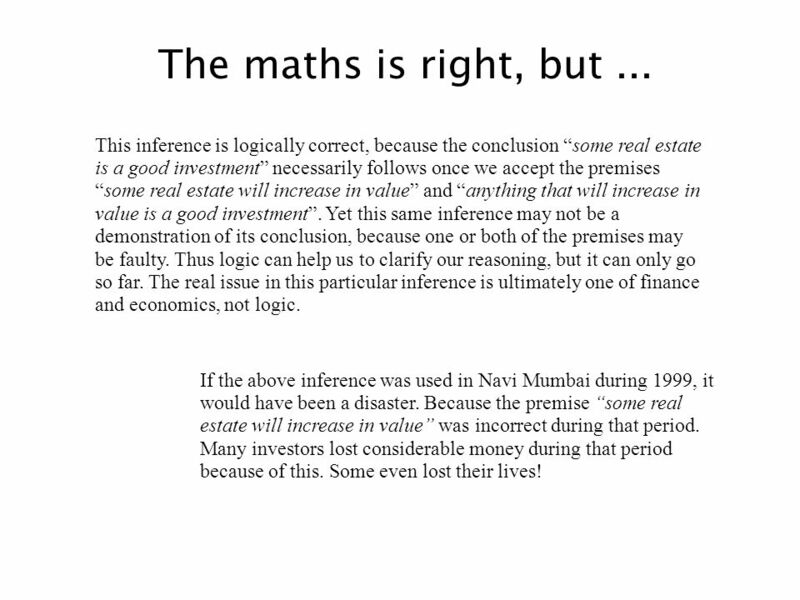 This inference is logically correct, because the conclusion “some real estate is a good investment” necessarily follows once we accept the premises “some real estate will increase in value” and “anything that will increase in value is a good investment”. Yet this same inference may not be a demonstration of its conclusion, because one or both of the premises may be faulty. Thus logic can help us to clarify our reasoning, but it can only go so far. The real issue in this particular inference is ultimately one of finance and economics, not logic. If the above inference was used in Navi Mumbai during 1999, it would have been a disaster. Because the premise “some real estate will increase in value” was incorrect during that period. Many investors lost considerable money during that period because of this. Some even lost their lives! 12 Propositions Of all the sentences that are used by humans to yield meaning, logic concerns itself with only those that yield truth values. Such sentences are known as statements or by some authors as propositions. The English teacher calls them declarative sentences. 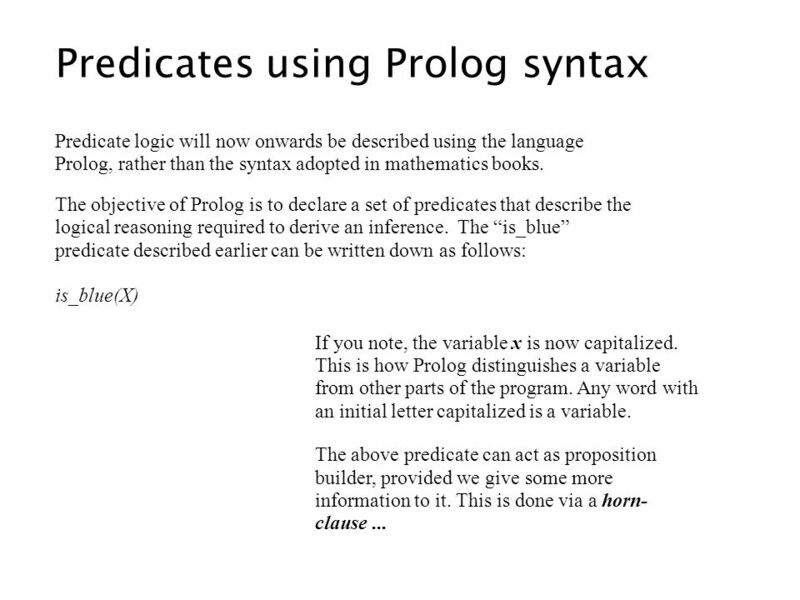 This may be the reason why Prolog is often called a declarative language. 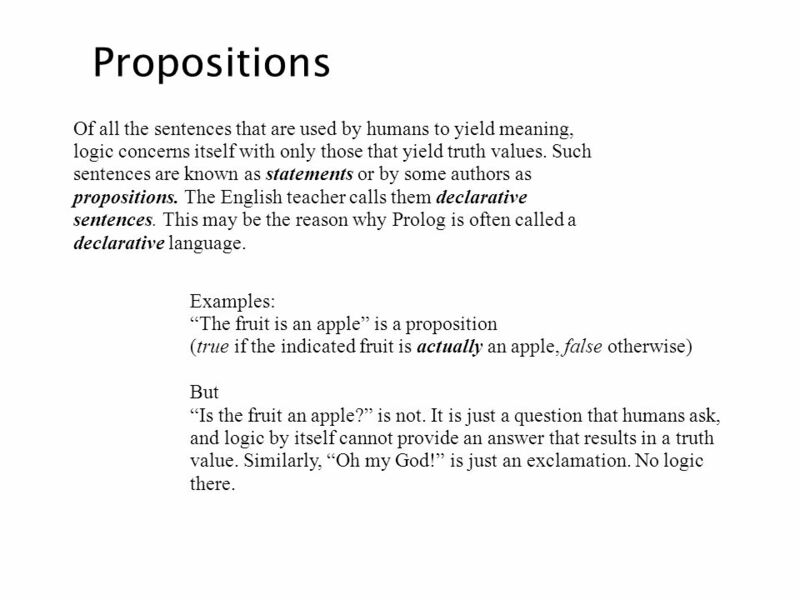 Examples: “The fruit is an apple” is a proposition (true if the indicated fruit is actually an apple, false otherwise) But “Is the fruit an apple?” is not. It is just a question that humans ask, and logic by itself cannot provide an answer that results in a truth value. Similarly, “Oh my God!” is just an exclamation. No logic there. 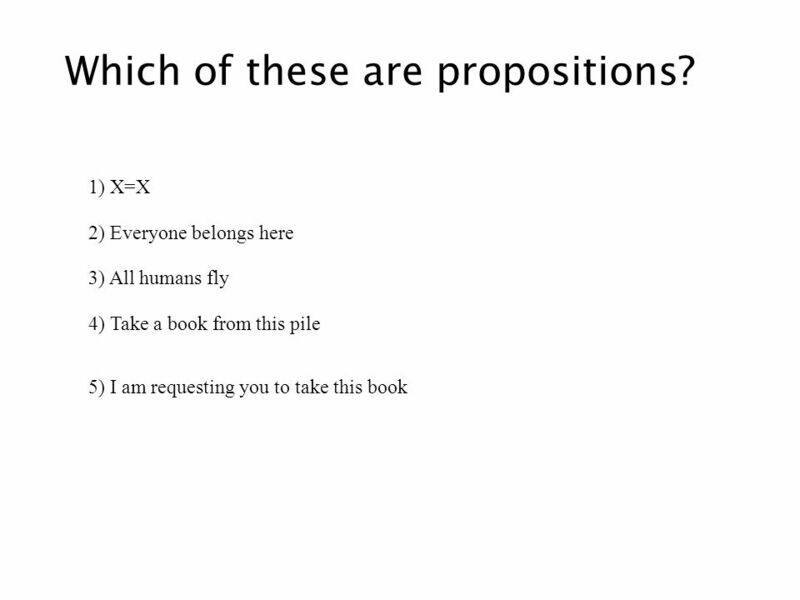 14 Which of these are propositions? 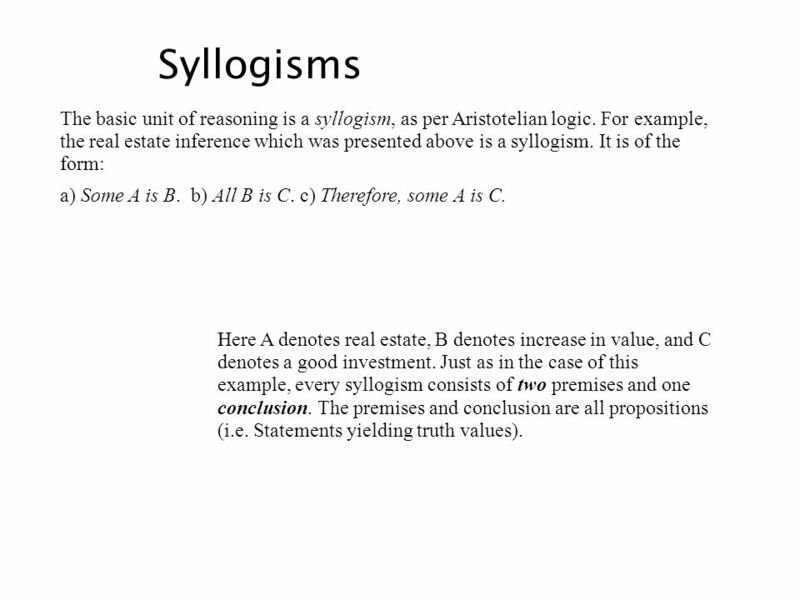 17 Syllogisms The basic unit of reasoning is a syllogism, as per Aristotelian logic. For example, the real estate inference which was presented above is a syllogism. It is of the form: a) Some A is B. b) All B is C. c) Therefore, some A is C. Here A denotes real estate, B denotes increase in value, and C denotes a good investment. Just as in the case of this example, every syllogism consists of two premises and one conclusion. The premises and conclusion are all propositions (i.e. Statements yielding truth values). Each of the premises and the conclusion is of one of four types: a) universal affirmative: All A is B. b) universal negative: No A is B. c) particular affirmative: Some A is B. d) particular negative: Some A is not B The letters A, B, C are known as terms. Every syllogism contains three terms. The two premises always share a common term which does not appear in the conclusion. This is known as the middle term. In our real estate example, the middle term is B, i.e., that which increases in value. 19 all A is B, all C is B, therefore some A is C does not. 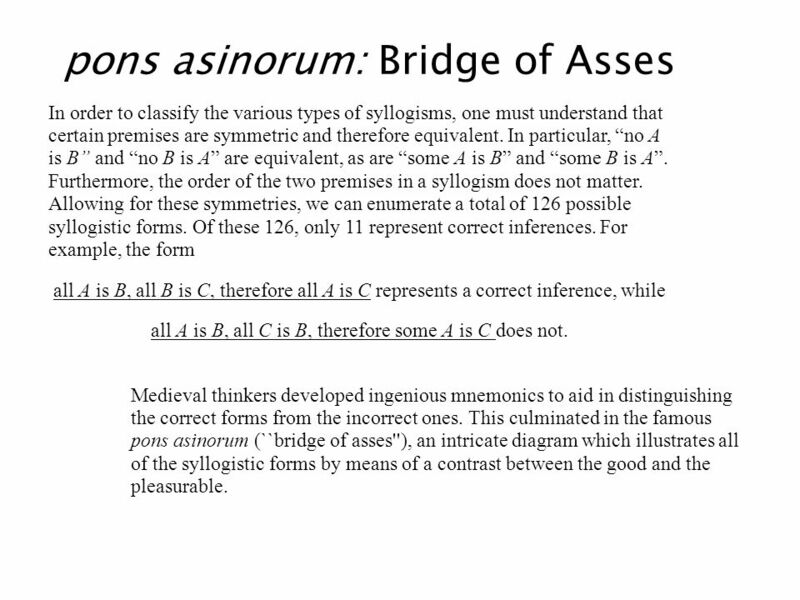 pons asinorum: Bridge of Asses In order to classify the various types of syllogisms, one must understand that certain premises are symmetric and therefore equivalent. In particular, “no A is B” and “no B is A” are equivalent, as are “some A is B” and “some B is A”. Furthermore, the order of the two premises in a syllogism does not matter. Allowing for these symmetries, we can enumerate a total of 126 possible syllogistic forms. Of these 126, only 11 represent correct inferences. For example, the form all A is B, all B is C, therefore all A is C represents a correct inference, while all A is B, all C is B, therefore some A is C does not. Medieval thinkers developed ingenious mnemonics to aid in distinguishing the correct forms from the incorrect ones. This culminated in the famous pons asinorum (``bridge of asses''), an intricate diagram which illustrates all of the syllogistic forms by means of a contrast between the good and the pleasurable. 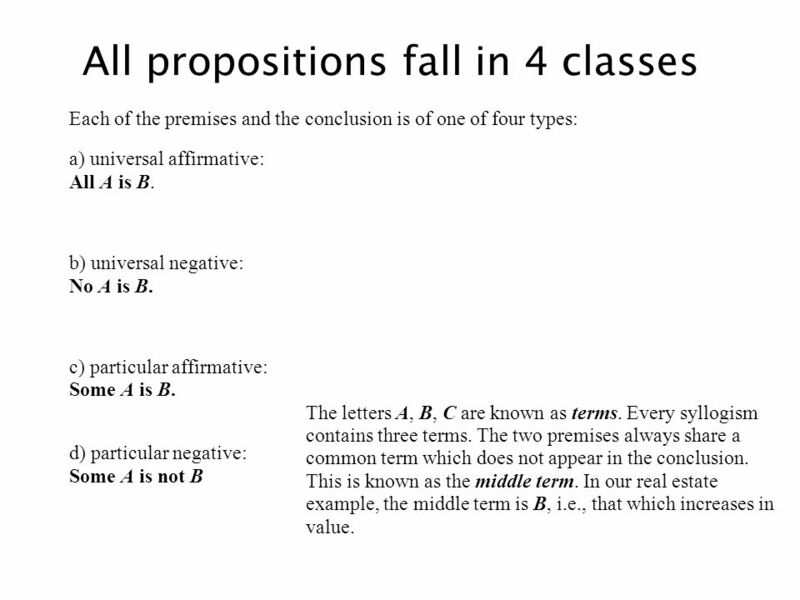 Apart from using the wrong syllogism for inferences, classifying propositions into the wrong category is an even more basic issue that affect our reasoning. 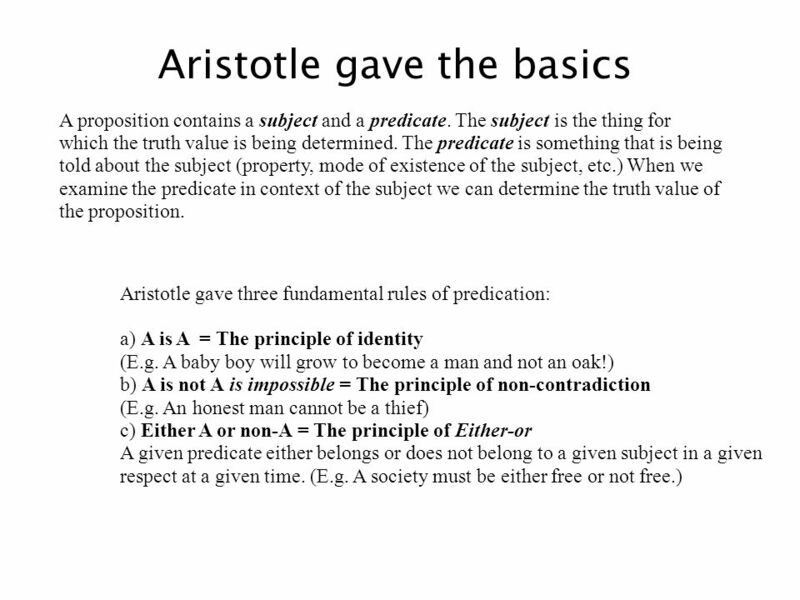 For example; we sometimes put a proposition into the universal affirmative instead of the particular affirmative. This often happens in inductive arguments, where we take an empirical observation and assume that it is a universal truth. 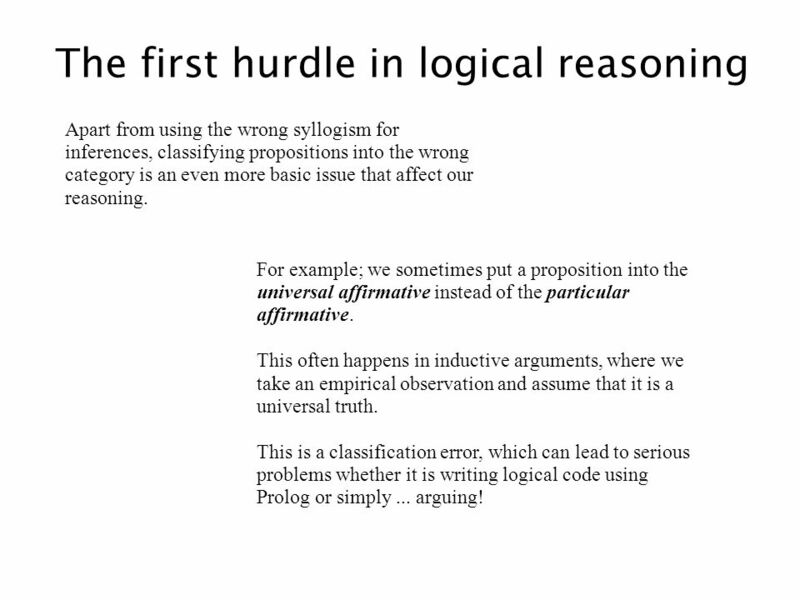 This is a classification error, which can lead to serious problems whether it is writing logical code using Prolog or simply ... arguing! Often simple propositions may not be sufficient to declare a premise. We may need to stitch up several propositions into one compound proposition. This is done using connectives. 1. Conjunctions- (P and Q) - for proposition to be true both P and Q must be true, if either of them is false, proposition is false. 2. 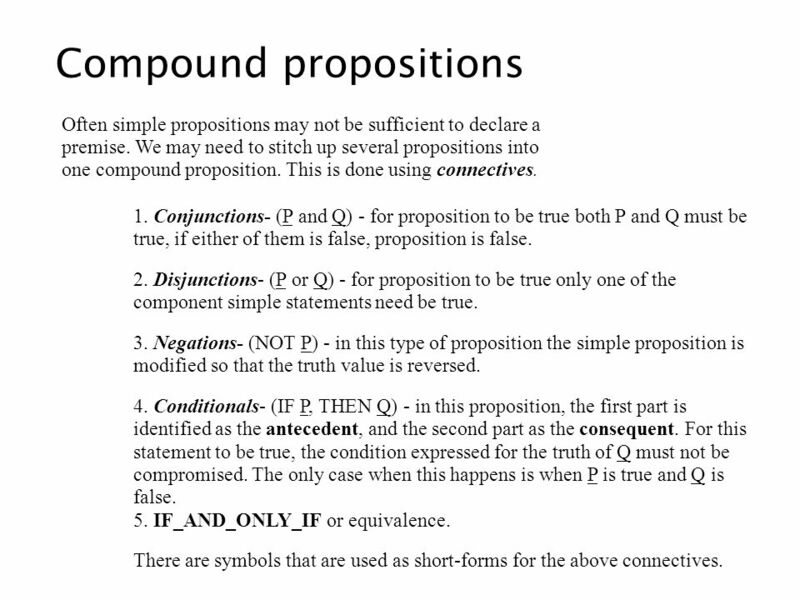 Disjunctions- (P or Q) - for proposition to be true only one of the component simple statements need be true. 3. Negations- (NOT P) - in this type of proposition the simple proposition is modified so that the truth value is reversed. 4. Conditionals- (IF P, THEN Q) - in this proposition, the first part is identified as the antecedent, and the second part as the consequent. For this statement to be true, the condition expressed for the truth of Q must not be compromised. The only case when this happens is when P is true and Q is false IF_AND_ONLY_IF or equivalence. There are symbols that are used as short-forms for the above connectives. 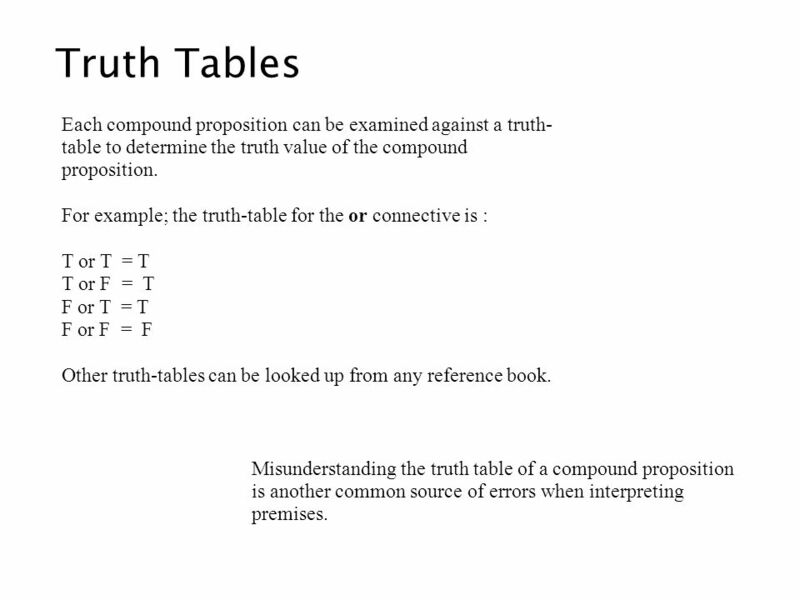 22 Truth Tables Each compound proposition can be examined against a truth-table to determine the truth value of the compound proposition. For example; the truth-table for the or connective is : T or T = T T or F = T F or T = T F or F = F Other truth-tables can be looked up from any reference book. Misunderstanding the truth table of a compound proposition is another common source of errors when interpreting premises. In 1879 the German philosopher Gottlob Frege gave a more powerful logical reasoning system that lead to the development of predicate logic. It overcame some of the problems in representing logical issues using propositional logic. 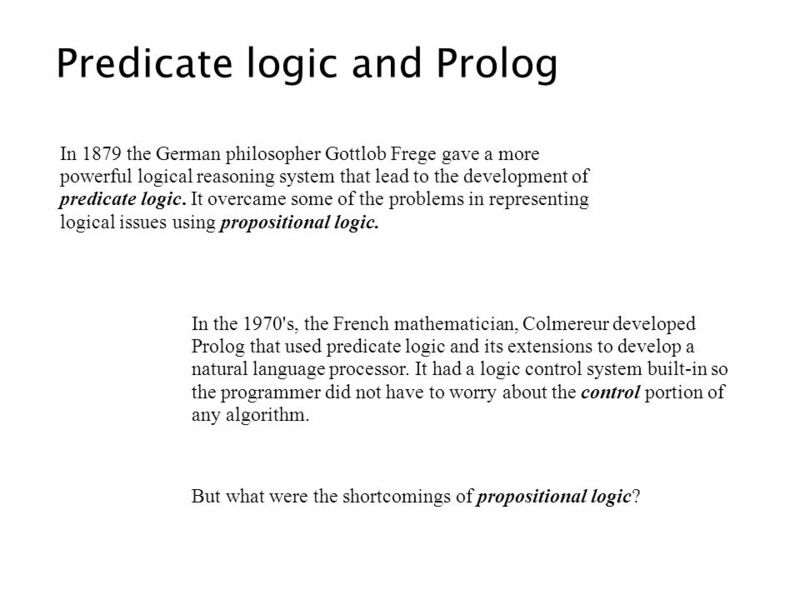 In the 1970's, the French mathematician, Colmereur developed Prolog that used predicate logic and its extensions to develop a natural language processor. 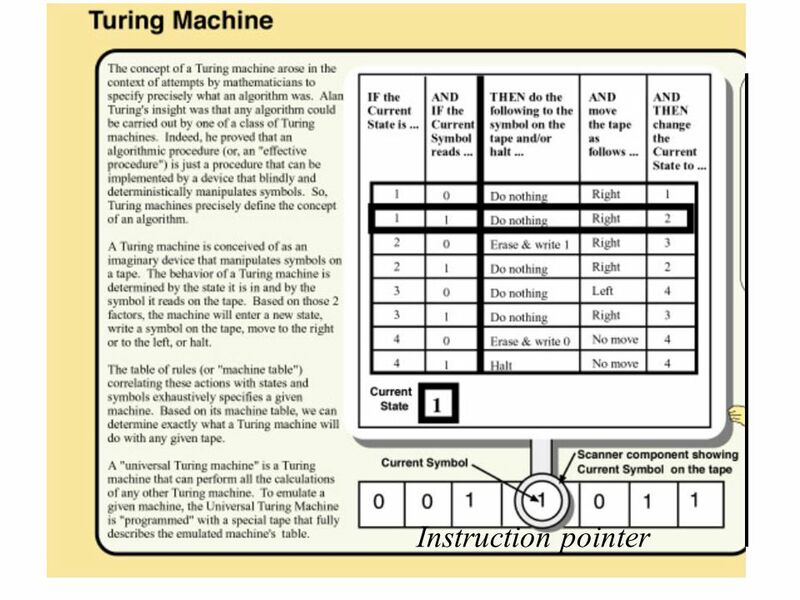 It had a logic control system built-in so the programmer did not have to worry about the control portion of any algorithm. But what were the shortcomings of propositional logic? 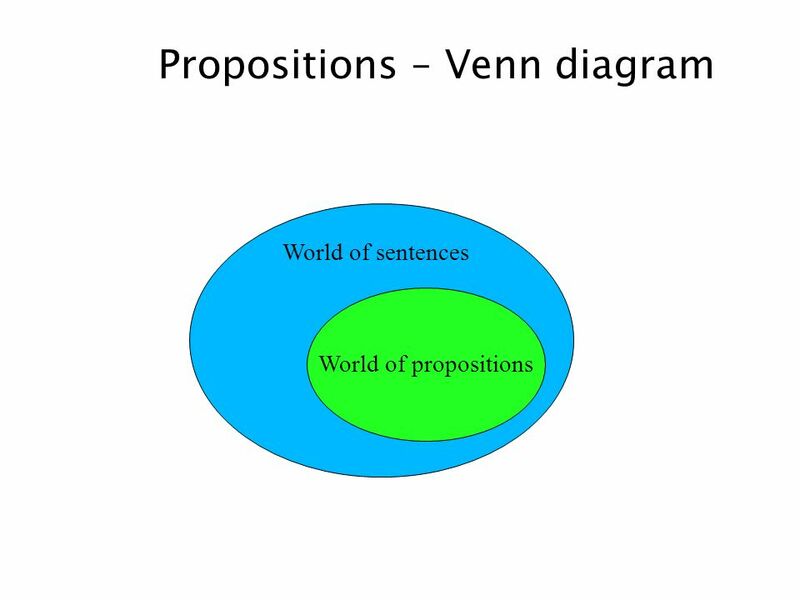 a) A proposition talks about the subject and its predicate. Both have to be known before hand. 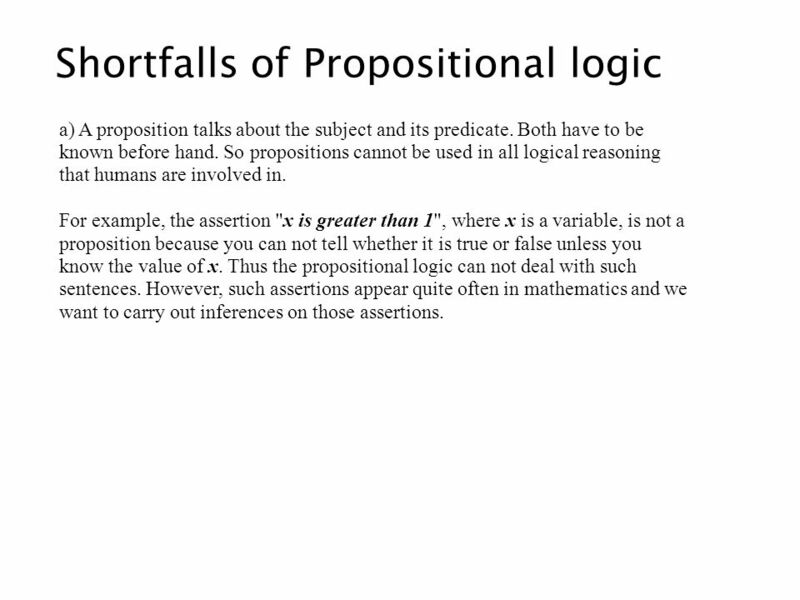 So propositions cannot be used in all logical reasoning that humans are involved in For example, the assertion "x is greater than 1", where x is a variable, is not a proposition because you can not tell whether it is true or false unless you know the value of x. Thus the propositional logic can not deal with such sentences. However, such assertions appear quite often in mathematics and we want to carry out inferences on those assertions. b) Propositional logic cannot be used for some equivalence determination. 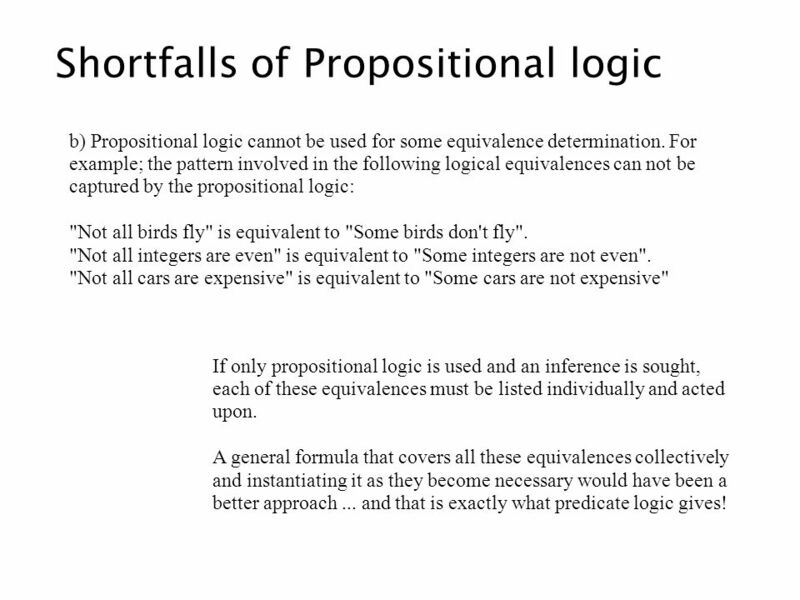 For example; the pattern involved in the following logical equivalences can not be captured by the propositional logic: "Not all birds fly" is equivalent to "Some birds don't fly". "Not all integers are even" is equivalent to "Some integers are not even". "Not all cars are expensive" is equivalent to "Some cars are not expensive" If only propositional logic is used and an inference is sought, each of these equivalences must be listed individually and acted upon A general formula that covers all these equivalences collectively and instantiating it as they become necessary would have been a better approach ... and that is exactly what predicate logic gives! 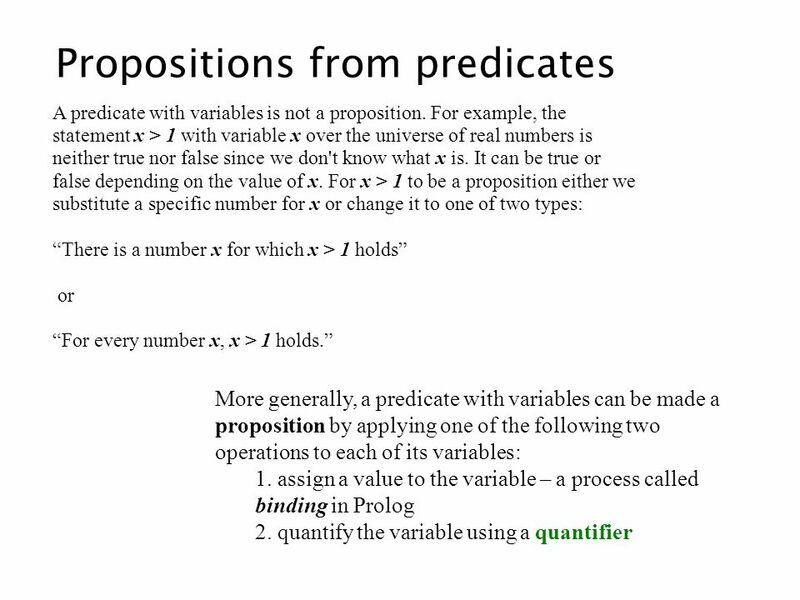 We had learnt earlier that a predicate describes a property of objects, or a relationship among objects In predicate logic, the predicate acts as a verb template to which the subject and objects are given as arguments. 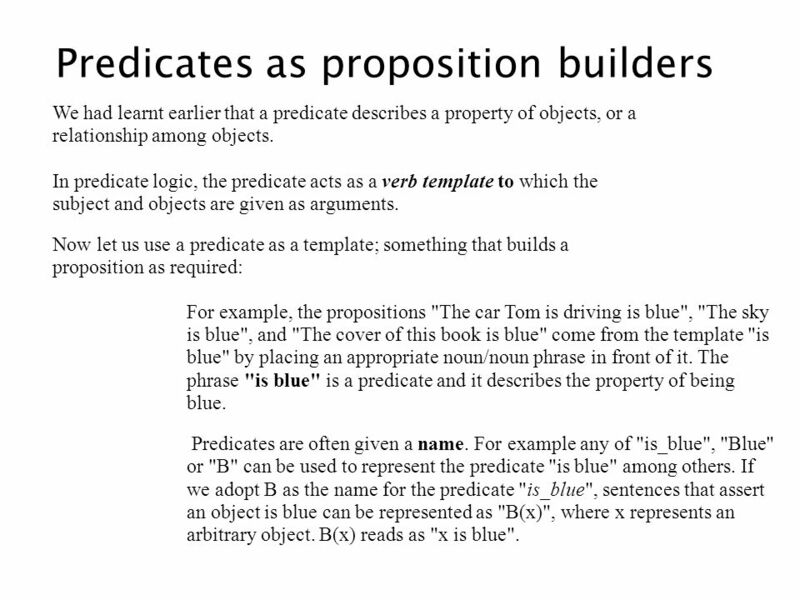 Now let us use a predicate as a template; something that builds a proposition as required: For example, the propositions "The car Tom is driving is blue", "The sky is blue", and "The cover of this book is blue" come from the template "is blue" by placing an appropriate noun/noun phrase in front of it. The phrase "is blue" is a predicate and it describes the property of being blue. Predicates are often given a name. For example any of "is_blue", "Blue" or "B" can be used to represent the predicate "is blue" among others. If we adopt B as the name for the predicate "is_blue", sentences that assert an object is blue can be represented as "B(x)", where x represents an arbitrary object. B(x) reads as "x is blue". Just like propositions can be stitched up together to form compound propositions using one of the 5 logical operators, similarly simple predicates can also be stitched up. A simple predicate like the is_blue ( or Bx) predicate is also known as an atomic formula. 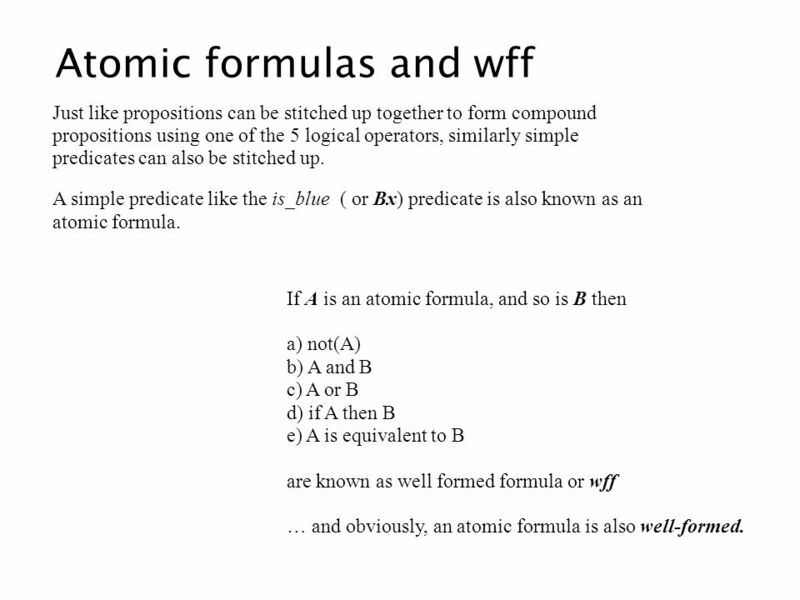 If A is an atomic formula, and so is B then a) not(A) b) A and B c) A or B d) if A then B e) A is equivalent to B are known as well formed formula or wff … and obviously, an atomic formula is also well-formed. 29 Quantifiers In general, a quantification is performed on formulas of predicate logic (called wff ), such as x > 1 or P(x), by using quantifiers on variables. 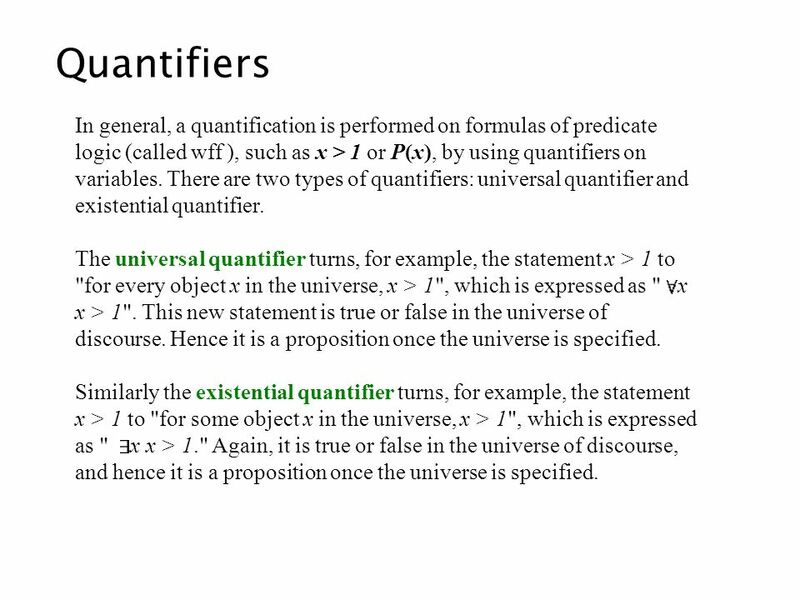 There are two types of quantifiers: universal quantifier and existential quantifier. The universal quantifier turns, for example, the statement x > 1 to "for every object x in the universe, x > 1", which is expressed as " x x > 1". This new statement is true or false in the universe of discourse. Hence it is a proposition once the universe is specified. Similarly the existential quantifier turns, for example, the statement x > 1 to "for some object x in the universe, x > 1", which is expressed as " x x > 1." Again, it is true or false in the universe of discourse, and hence it is a proposition once the universe is specified. to generate propositions, we need to give more information. What may X stand for? 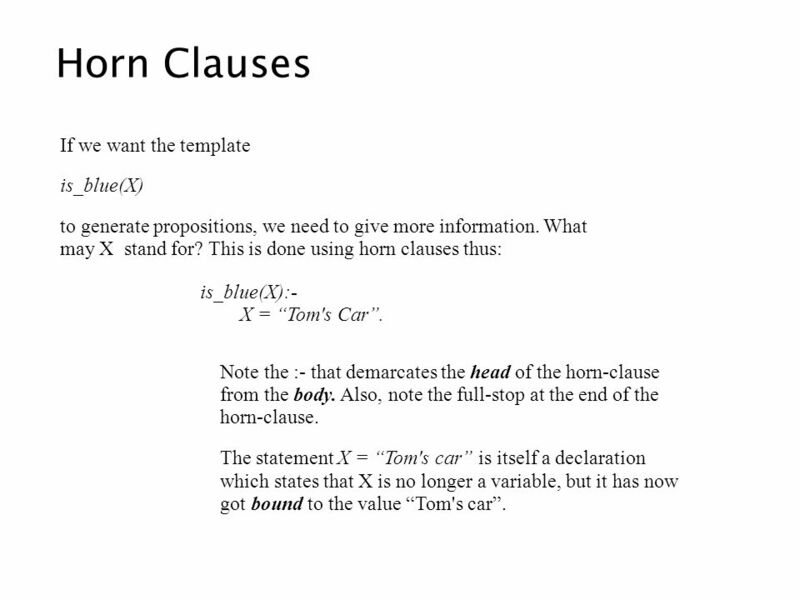 This is done using horn clauses thus: is_blue(X): X = “Tom's Car”. Note the :- that demarcates the head of the horn-clause from the body. Also, note the full-stop at the end of the horn-clause. The statement X = “Tom's car” is itself a declaration which states that X is no longer a variable, but it has now got bound to the value “Tom's car”. Though in this example there is only one statement, the clause body can describe a compound set of predicate calls stitched up by conjunctions. 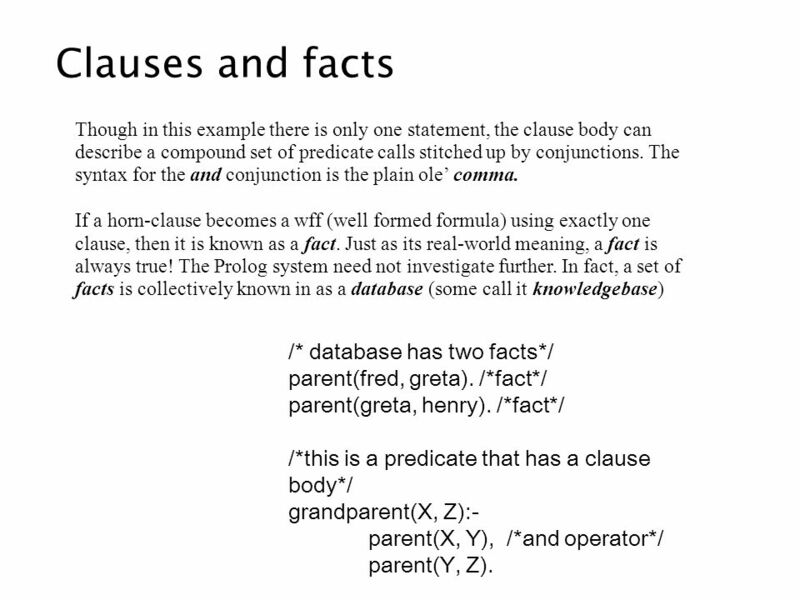 The syntax for the and conjunction is the plain ole’ comma If a horn-clause becomes a wff (well formed formula) using exactly one clause, then it is known as a fact. Just as its real-world meaning, a fact is always true! The Prolog system need not investigate further. In fact, a set of facts is collectively known in as a database (some call it knowledgebase) /* database has two facts*/ parent(fred, greta). /*fact*/ parent(greta, henry). /*fact*/ /*this is a predicate that has a clause body*/ grandparent(X, Z):- parent(X, Y), /*and operator*/ parent(Y, Z). 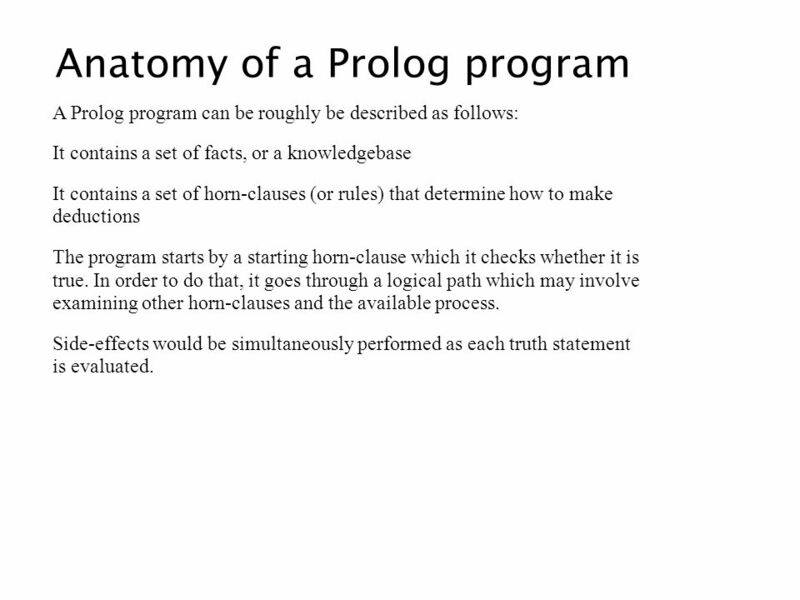 A Prolog program can be roughly be described as follows: It contains a set of facts, or a knowledgebase It contains a set of horn-clauses (or rules) that determine how to make deductions The program starts by a starting horn-clause which it checks whether it is true. In order to do that, it goes through a logical path which may involve examining other horn-clauses and the available process. Side-effects would be simultaneously performed as each truth statement is evaluated. At this point, we have given the Prolog system all that is needed to get a simple inference done. 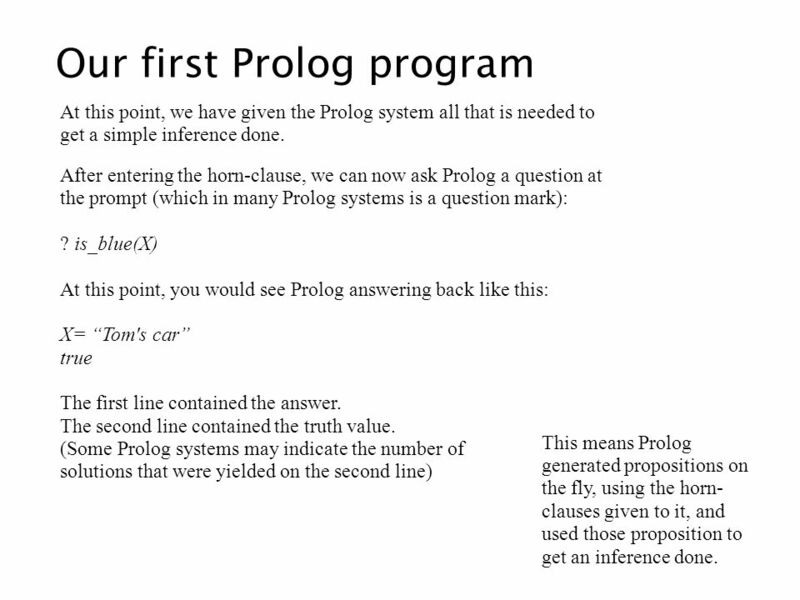 After entering the horn-clause, we can now ask Prolog a question at the prompt (which in many Prolog systems is a question mark): ? is_blue(X) At this point, you would see Prolog answering back like this: X= “Tom's car” true The first line contained the answer. The second line contained the truth value. 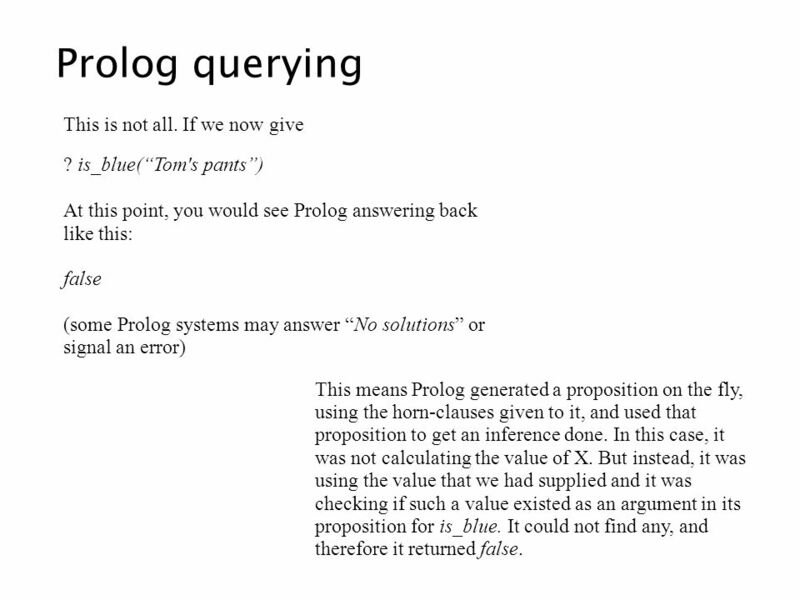 (Some Prolog systems may indicate the number of solutions that were yielded on the second line) This means Prolog generated propositions on the fly, using the horn- clauses given to it, and used those proposition to get an inference done.
? is_blue(“Tom's pants”) At this point, you would see Prolog answering back like this: false (some Prolog systems may answer “No solutions” or signal an error) This means Prolog generated a proposition on the fly, using the horn-clauses given to it, and used that proposition to get an inference done. In this case, it was not calculating the value of X. But instead, it was using the value that we had supplied and it was checking if such a value existed as an argument in its proposition for is_blue. It could not find any, and therefore it returned false. What has happened here, is that the simple three line program can be used by Prolog in multiple ways This happens because a variable in Prolog, unlike in any other procedural language, can either be bound or free In the first case, the horn-clause is_blue was being used where the variable X was free. (i.e. We did not supply any constant as an argument. 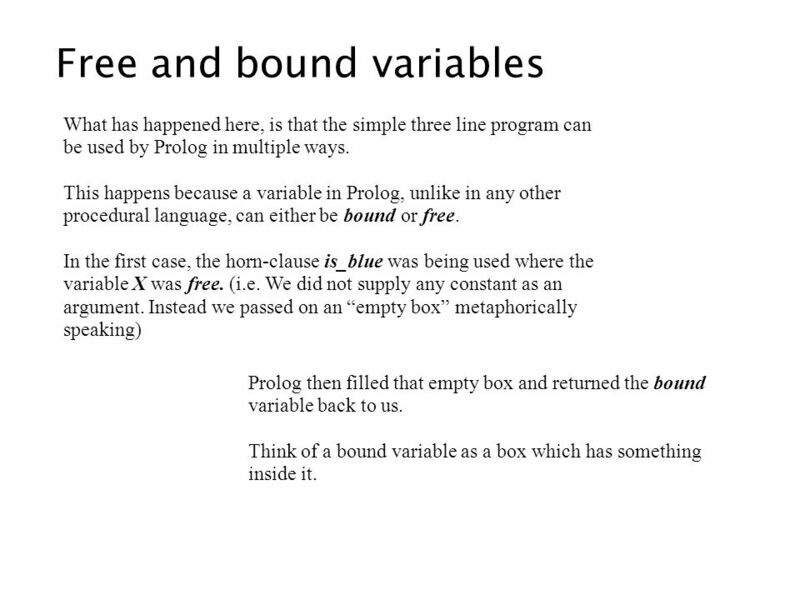 Instead we passed on an “empty box” metaphorically speaking) Prolog then filled that empty box and returned the bound variable back to us Think of a bound variable as a box which has something inside it. 37 Bound variables In the second example, the value “Tom's pants” was passed as an argument to the horn-clause. 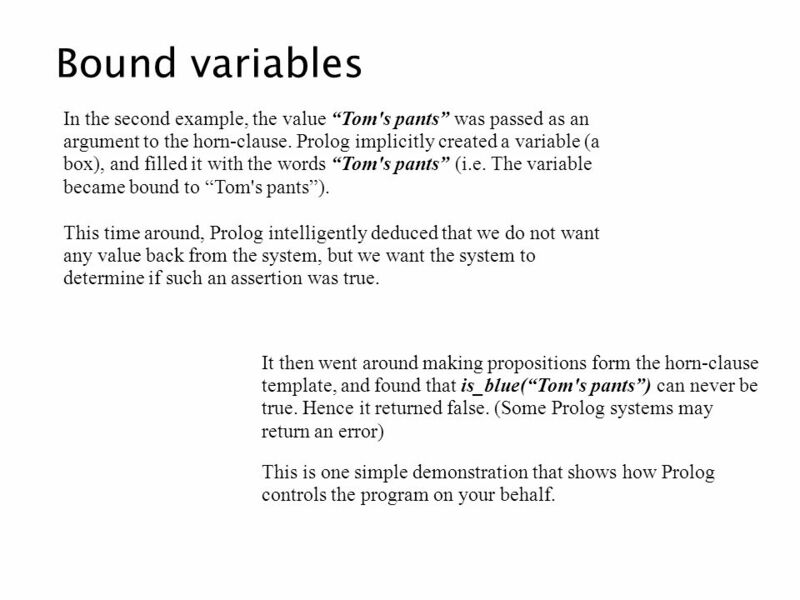 Prolog implicitly created a variable (a box), and filled it with the words “Tom's pants” (i.e. The variable became bound to “Tom's pants”) This time around, Prolog intelligently deduced that we do not want any value back from the system, but we want the system to determine if such an assertion was true. It then went around making propositions form the horn-clause template, and found that is_blue(“Tom's pants”) can never be true. Hence it returned false. 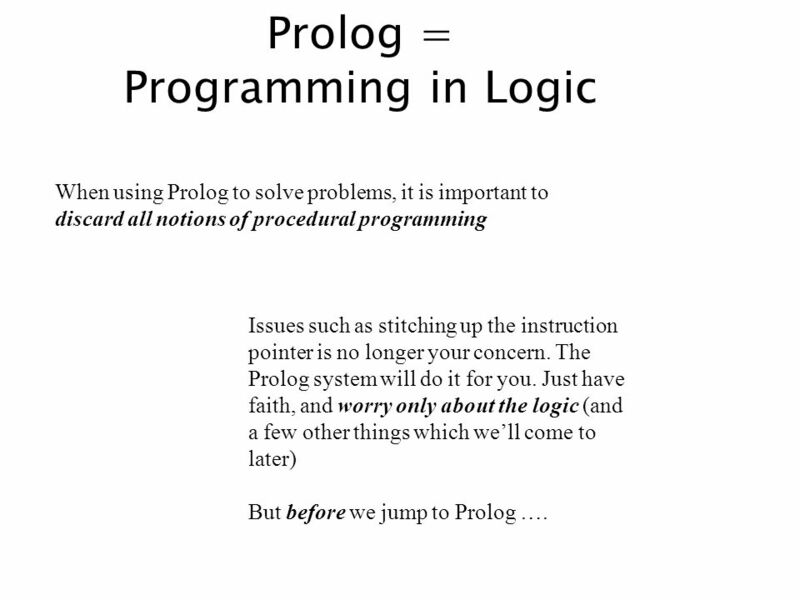 (Some Prolog systems may return an error) This is one simple demonstration that shows how Prolog controls the program on your behalf. 39 What is in our hands? Not in our hands! in our hands! from the world outside from within the computer … Not in our hands! 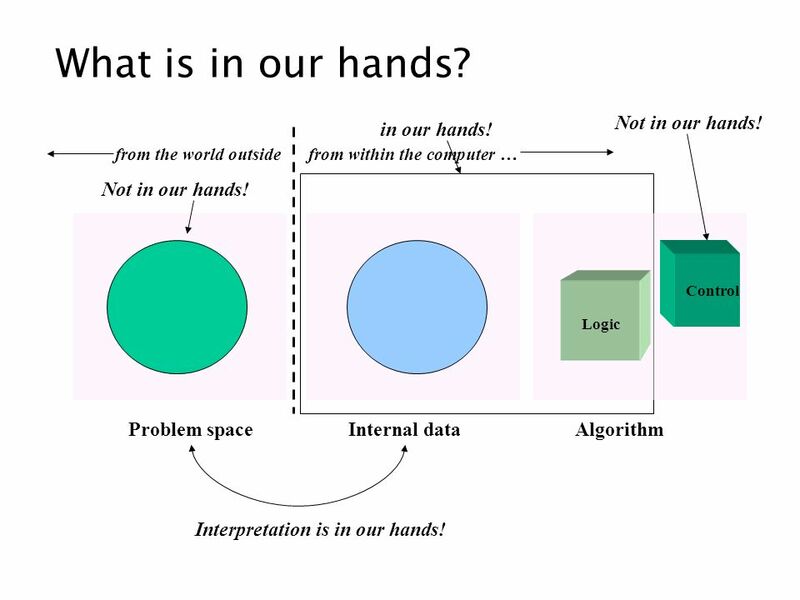 Logic Control Problem space Internal data Algorithm Interpretation is in our hands! Theories regarding representing the real word in a logically correct mathematical model has occupied the minds of most philosophers. Fortunately, much of the problem space that programmers encounter is not as complicated as those handled by philosophers! This is because programs written today are for extremely focussed problem spaces, which are actually quite small – even if the programmer may think otherwise. 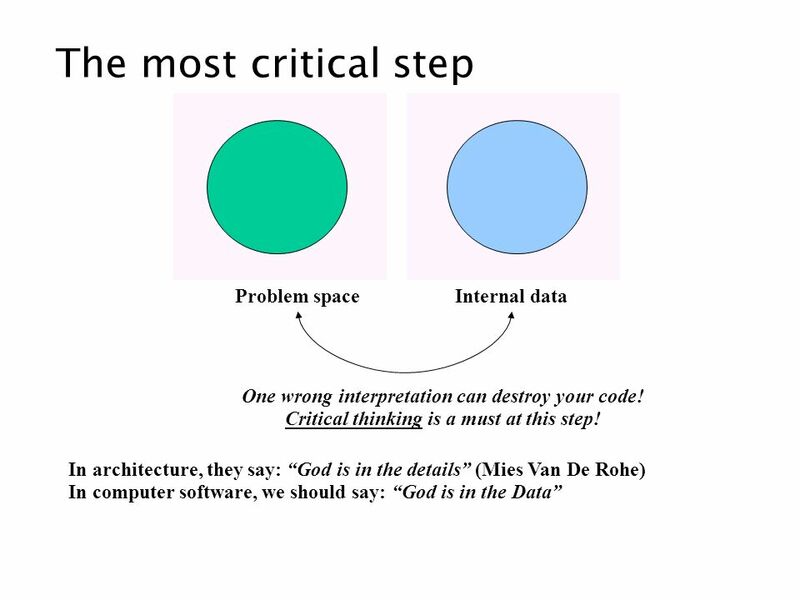 The area of interest to the programmer is also known as the universe of discourse or just universe in some literature. 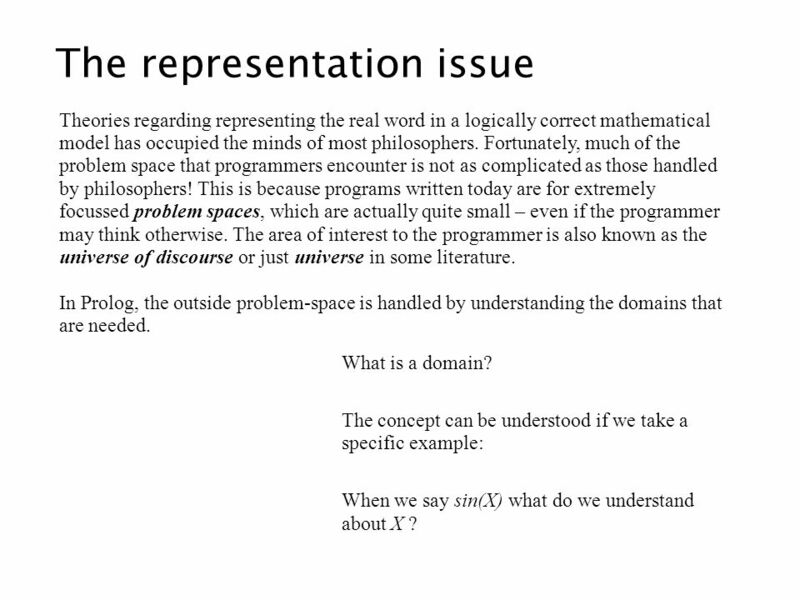 In Prolog, the outside problem-space is handled by understanding the domains that are needed. What is a domain? The concept can be understood if we take a specific example: When we say sin(X) what do we understand about X ? 42 Domains When we say sin(X) what implications can we make about X ? X has to be an angle which will invariably lie between zero and 2pi. In short, we understand that of the various things nice, beautiful, ugly, whatever that is out there in the whole wild, wide world, X can only be bound to values from one small corner of it. We therefore have clearly established the domain of X. 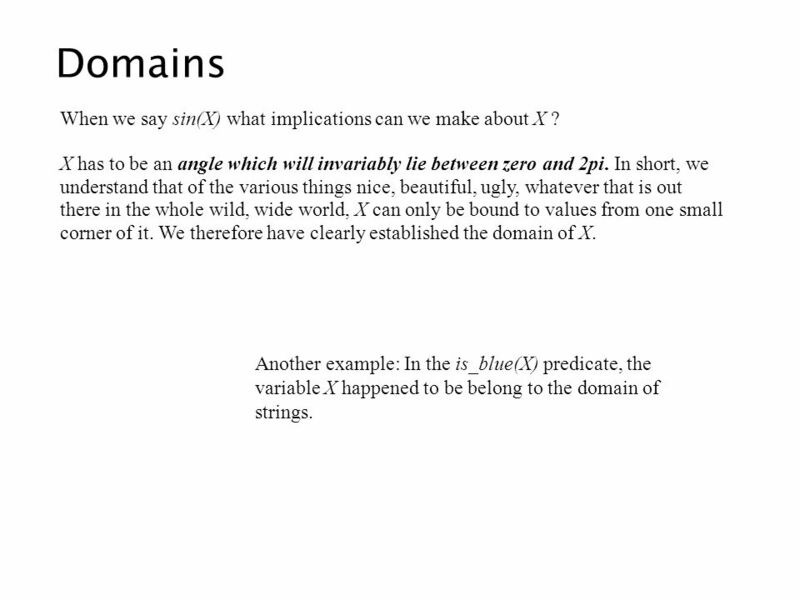 Another example: In the is_blue(X) predicate, the variable X happened to be belong to the domain of strings. 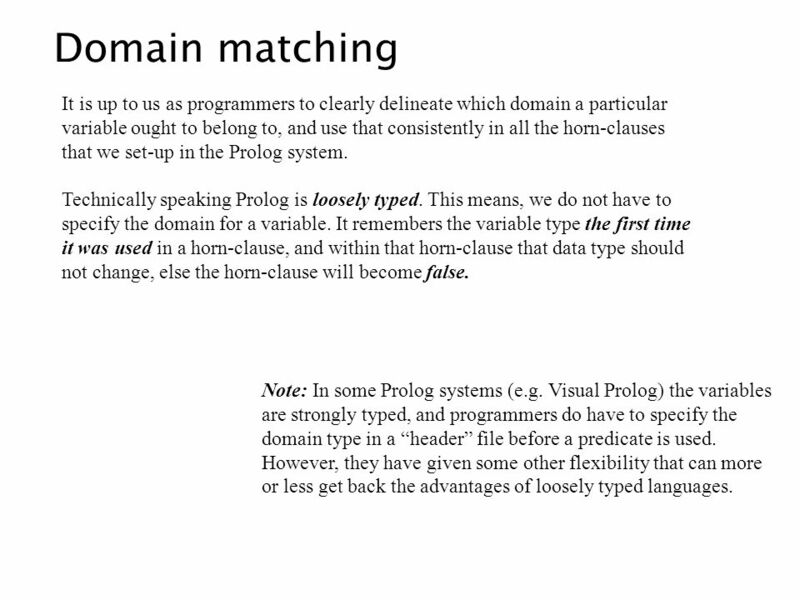 43 Domain matching It is up to us as programmers to clearly delineate which domain a particular variable ought to belong to, and use that consistently in all the horn-clauses that we set-up in the Prolog system. Technically speaking Prolog is loosely typed. This means, we do not have to specify the domain for a variable. It remembers the variable type the first time it was used in a horn-clause, and within that horn-clause that data type should not change, else the horn-clause will become false. Note: In some Prolog systems (e.g. Visual Prolog) the variables are strongly typed, and programmers do have to specify the domain type in a “header” file before a predicate is used. However, they have given some other flexibility that can more or less get back the advantages of loosely typed languages. 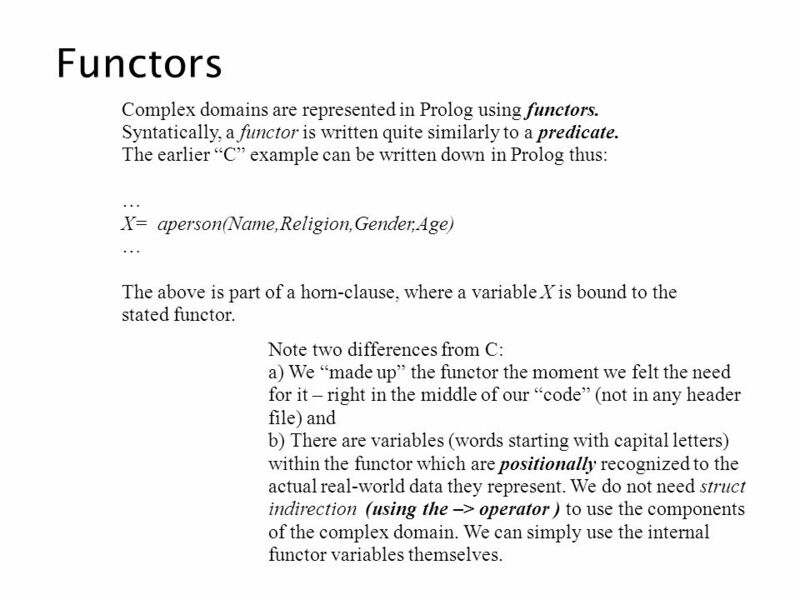 45 Functors Complex domains are represented in Prolog using functors. Syntatically, a functor is written quite similarly to a predicate. The earlier “C” example can be written down in Prolog thus: … X= aperson(Name,Religion,Gender,Age) … The above is part of a horn-clause, where a variable X is bound to the stated functor. Note two differences from C: a) We “made up” the functor the moment we felt the need for it – right in the middle of our “code” (not in any header file) and b) There are variables (words starting with capital letters) within the functor which are positionally recognized to the actual real-world data they represent. 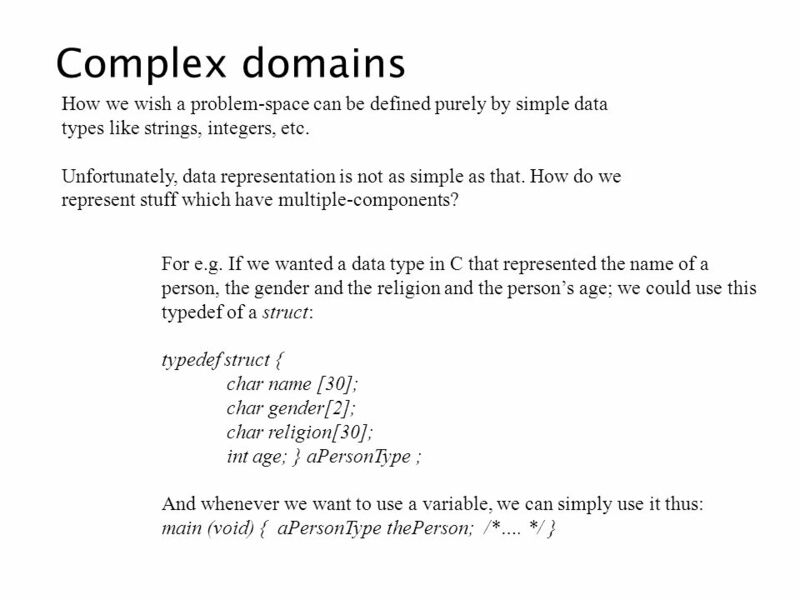 We do not need struct indirection (using the –> operator ) to use the components of the complex domain. We can simply use the internal functor variables themselves. 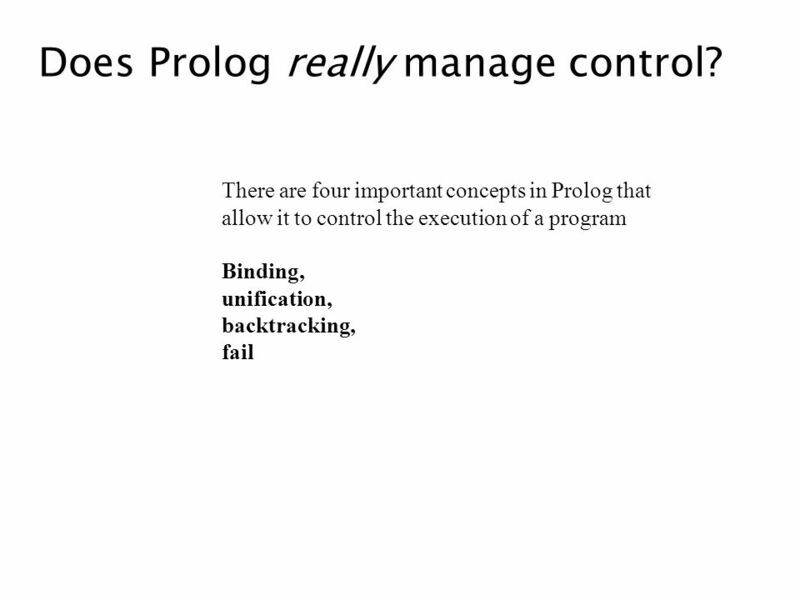 46 Does Prolog really manage control? 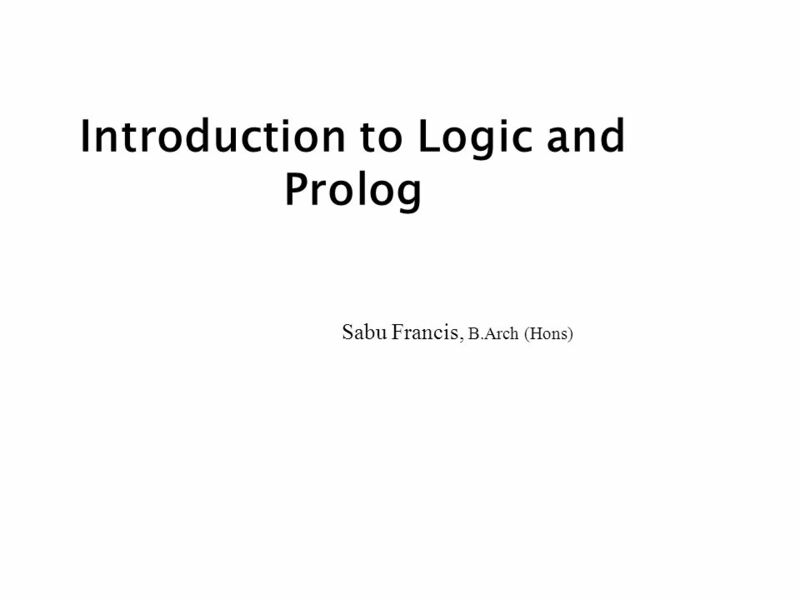 Download ppt "Introduction to Logic and Prolog"
Inference and Reasoning. Basic Idea Given a set of statements, does a new statement logically follow from this. For example If an animal has wings and. Logic Use mathematical deduction to derive new knowledge. 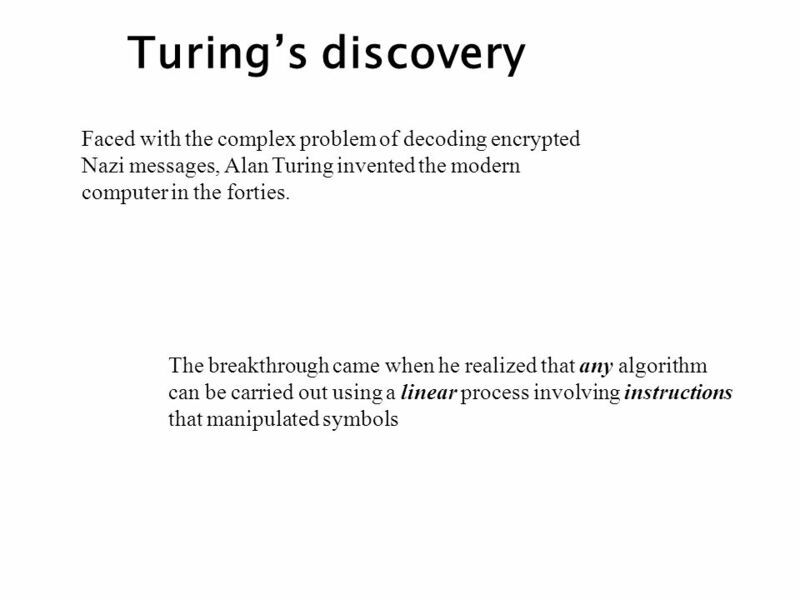 Alpha: Symbolization and Inference Bram van Heuveln Minds and Machines Lab RPI.